Being able to relax while your maid works is highest on most people’s wishlist. So how do we make sure that you can? We work on whatever basis is best for you, taking care of chores like ironing and laundry, as well as cleaning. Using the latest Prochem technology, we use dry cleaning for natural fibres, and hot water extraction for synthetic fabric. There’s also our chat facility and booking form for you to use here online. Send us the details of your appointment, and we’ll send you your free quote, or get back to you as soon as we can. 1 review has been written for Cleanerswoolton.co.uk yet. I would not hesitate to recommend Cleaners Woolton to anyone who is looking for a cleaning company that will exceed all expectations. They have impeccable cleaning practices and their weekly rotation plan ensures our home is thoroughly cleaned. The web server with the IP-address 109.121.147.52 used by Cleanerswoolton.co.uk is run by Lulin-Net and is located in Bulgaria. 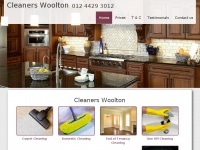 The server runs exclusively the website Cleanerswoolton.co.uk. A Apache server hosts the websites of Cleanerswoolton.co.uk. For managing the data of the webpages the CMS WordPress in the version 4.9.5 is used. The website uses the latest markup standard HTML 5. The website does not specify details about the inclusion of its content in search engines. For this reason the content will be included by search engines.